A school could help restore the reputation of the notorious hooded top after making it part of its uniform. Richard Haigh, principal of Coombeshead College, Newton Abbot, Devon, has criticised "hysterical" stereotyping of 'hoodie' wearers as thugs. "Most young people are fine, upstanding citizens, and some of them wear hoodies. Why should they be tarred with this rather hysterical brush?" he said. Bluewater shopping centre, Greenhithe, Kent, last week banned hooded tops. This was part of a new code of conduct for visitors aimed at tackling anti-social behaviour at the complex. "It's the behaviour that's the problem, not the clothing," Mr Haigh said on Thursday. He added: "If you know how young people's minds work, the best way of encouraging them to do something is to ban it. "The more fuss we make about hoodies and baseball caps, the more a certain type of young person will want to wear them." 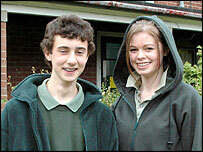 Hooded tops have been part of the uniform at Coombeshead College, a 1,600-strong media and arts college, for two years. Between 10 and 15% of students wear them, the headmaster estimated. They are only allowed to put up the hoods when it is raining. In a letter that he described as "tongue in cheek" to the Times on Wednesday, Mr Haigh wrote: "I am disappointed by the lack of subtlety in dealing with the hoodie problem. "Follow our example and make them part of school uniform. How uncool does that make them?"